Figure 1. The persistent painless ulcer on the leg, shown here at 12 months’ duration. Figure 2. Pyoderma gangrenosum. Note the typical violaceous undermined edge. 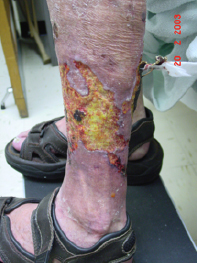 A 42-year-old greenkeeper presents with a large, deep, ulcerated lesion on the medial aspect of his right leg that has been present for six months. He is able to walk without trouble and claims not to be in severe pain. He has no other skin lesions and is otherwise well with normal immunity. The patient says that he is sure he has acquired ‘a mite under the skin’ in the course of his work, and he has been trying to remove it himself. He cannot be persuaded otherwise by medical staff. A biopsy from the edge of the ulcer does not show any pathological process other than necrosis. There is a sharp cutoff line between normal and abnormal skin. Swabs produce a growth of Pseudomonas aeruginosa and Escherichia coli; these were both considered to be contaminants rather than pathogens. Tissue sent for mycobacteria and fungal culture produce no growth; PCR testing for mycobacteria on biopsy tissue is negative. An autoimmune screen is negative. A full blood count, C-reactive protein (CRP), erythrocyte sedimentation rate (ESR) and liver function tests are all within normal ranges. Treatment with ceftriaxone does not make any difference to the ulcer, which continues to enlarge over the next six months and eventually doubles in size (Figure 1). A trial of high-dose prednisone is completely ineffective. Prolonged treatment with minocycline, prescribed in the event of possible mycobacterial infection, is also ineffective. Pyoderma gangrenosum. This ulcerative condition is usually seen in patients with inflammatory bowel disease, rheumatoid arthritis or systemic lupus erythematosus. It is usually very painful. Pyoderma gangrenosum is not characterised by a diagnostic appearance on biopsy but tissue does exhibit intense nonspecific inflammatory changes without vasculitis. Clinically, the base of the ulcer is necrotic and sloughy and the edge is characteristically violaceous and undermined (Figure 2). It usually responds quickly to high-dose oral prednisone and oral cyclosporin. Wegener’s granulomatosis. This rare vasculitis presents predominantly with ear, nose and throat abnormalities but it can involve the skin. One of its protean manifestations is cutaneous ulceration. Patients are usually unwell and febrile, with a positive perinuclear antineutrophil cytoplasmic antibody (p-ANCA) test, high acute phase reactants and leucocytoclastic vasculitis on skin biopsy. Mycobacterial and deep fungal infection. In the normal, nonimmunosuppressed host in Australia, severe ulcerative lesions from mycobacteria are rare. Nevertheless, the possibility should be considered in the differential diagnosis. A micro-organism such as Mycobacterium marinum, which is often acquired from fish tanks, may produce ulcerative skin lesions. It can sometimes be difficult to culture these organisms or even to identify them on PCR. Biopsy demonstrates a granulomatous appearance. Dermatitis artefacta with delusions of parasitosis. This is the correct diagnosis in the case described above; it is a diagnosis of exclusion. ‘Delusions of parasitosis’ is a condition in which patients are convinced that they are infested by insects, and they may damage their skin as a result. The associated psychiatric disorders are varied. Some patients demonstrate the condition as a manifestation of a psychosis, some simply have a fixed idea, and others have a monosymptomatic delusion (i.e. they are otherwise psychologically intact). This is sometimes called Morgellons disease, a condition in which sufferers have the delusional belief that they are infested with disease-causing agents described as, for example, insects, parasites, hairs or fibres. Diagnostic clues include the bizarre appearance of the ulcer, lack of symptoms, histopathology showing chemical necrosis, and normal cultures and serology. In this case, the patient volunteered that he had produced the ulcer in an attempt to remove an insect from his skin. Self-inflicted injury of this magnitude is rare. Patients may also self-inflict injury for reasons that involve secondary gain. Munchausen’s disease is an example. It is very difficult to help patients with this diagnosis. Although the abnormal ideation may resolve with antipsychotic medication, patients usually resist the idea that they have a psychiatric condition vigorously. As a result, they often go through life with their illness. Gaining a patient’s trust and enlisting the help of family members are keys to helping them get the treatment they need.